We consider this furnace to be one of our best offers. This gas furnace has an AFUE rating of 95% which means that 95 cents of every $1.00 of heating energy expense warms your home. 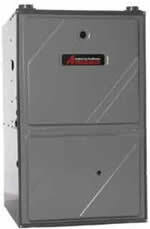 This furnace is covered by what we consider to be one of the best warranties in the indoor home comfort industry. If the heat exchanger ever fails to the original, registered, homeowner we will provide a new furnace. 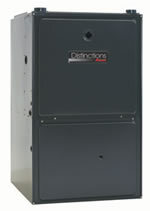 This furnace also has a 10-Year Parts Limited Warranty* on all functional parts. For a full description of all warranties applicable to this product, please call us. This furnace is covered by one of what we believe to be the best warranties in the indoor home comfort industry. If the heat exchanger ever fails to the original, registered, homeowner we will provide a new furnace. This furnace also has a 10-Year Parts Limited Warranty* on all functional parts. For a full description of all warranties applicable to this product, please call us. Don’t risk your home comfort on the coldest day of the year; install the long-lasting ACVC9 gas furnace. This gas furnace has an AFUE rating of 93% which means that 93 cents of every $1.00 of heating energy expense warms your home. Don’t risk your home comfort on the coldest day of the year; install the long-lasting ACV9 gas furnace. This gas furnace has an AFUE rating of 93% which means that 93 cents of every $1.00 of heating energy expense warms your home. This gas furnace has an AFUE rating of 95% which means that 95 cents of every $1.00 of heating energy expense warms your home. Homeowners wishing to increase the comfort level in their home during the winter months and save money year round should consider installing this gas furnace compared to the gas furnace currently installed in their home. This gas furnace has an AFUE rating of up to 95%, which means that up to 95 cents of every $1.00 of heating energy expense warms your home. With a corrosion-resistant, painted steel cabinet, furnace can be installed in a variety of locations without compromising its performance. This gas furnace has an AFUE rating of 92.1% which means that 92 cents of every $1.00 of heating energy expense warms your home.